I just wanted to see what that was like... So, I will ramble. -I am reading FARTHING by Jo Walton right now. Good so far! -I want the sequels for sure. -I finally found a program to read on my tablet. I paid for it and everything! It is called Mantano. It is pretty great so far. I even like reading .pdf on it. -Don't forget the Virtual Advent tour sign-ups are now open. -I joined postcrossing.com!! Postcards! Yay! I am excited! What are your rambles for the day? 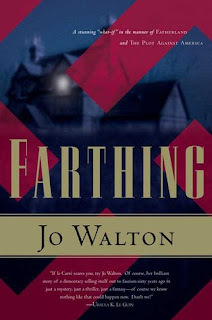 I really enjoyed Farthing too, and I have the first sequel on my pile to read. I'm happy you are liking it too! lovely little rambles, it's been that kind of Sunday, hasn't it? I love posting with my tablet... but it is hugely annoying to add links. So, I hear you! What appealed to you about the Mantano reading app? I haven't really found any I like, although the Nook app is pretty decent for those books. Farthing made me too anxious to keep going, but I hope you like it all the way through! Great job! I have been so hesitant to post while using my iPad. I should do some test posts like you only because I'll be traveling at the end of the month and will only that and not my laptop. I love Bluefire for my reading app. Nook's app is wonderful too for all of my Nook books. How is Mantano different? Thanks for the tip about Mantano - I didn't know about it; just look it up. It looks really helpful! b) did you use a special program or just the web? I have Farthing on my TBR pile and want to get around to it soon - good to know it's worth it.